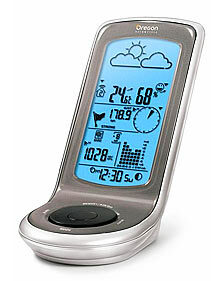 The System - is based around the Oregon Scientific Professional Weather Station model WMR 100. 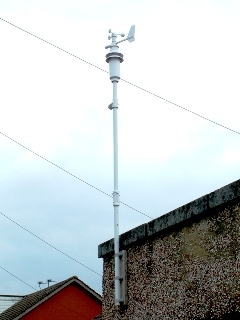 The WMR 100 consists of three main parts, the base station, the rain gauge and the combined wind / temperature sensors. I chose this model because of the price and it looked to be simple to install. When the unit arrived I set it up and all seemed well until I connected it to my computer. I found that the base station would not talk to the computer over the USB connection. I contacted Oregon UK and they suggested the base station was faulty and I needed to return the whole system back to the supplier for exchange. About a week later the replacement arrived and this system worked ok and communicated with my computer. Wind / Temperature - I have mounted the combined wind / outside temperature sensors on the garage wall at the far end of the garden (see photo to right). This was the best place I could find to mount it although not ideal. I live in an urban area, surrounded by other houses so the wind speed and direction measurement are sheltered by the houses in the locality from the south and a little from the north. Other considerations for location were that I need to replace the batteries periodically. After about four months of operation, the wind speed measurements started to become intermittent. Firstly I tried replacing the batteries but no improvement. I contacted Oregon and they agreed to replace the wind / temperature sensor. About week later the replacement arrived and has been fine since apart from replacing the batteries again. Reading on the Ambient Weather forums, people recommend using Lithium batteries and I have used four Energizer Ultimate Lithium AA batteries which seemed to worked well over the winter. 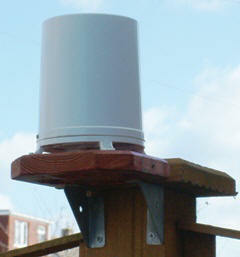 Rain Gauge - This is a separate unit and initially had some trouble with the wireless communication to the base station. It seems many other people have had the same problems. After moving it around about three different location within the garden, I found by accident that rotating the rain gauge 90 degrees the wireless communication improved, maybe the aerial is directional. Another improvement was replacing the batteries with Energizer Ultimate Lithium AA, it has since been faultless. The Lithium batteries are a slightly higher voltage than alkaline batteries and this may have helped. Since the rain gauge only has two batteries, it could well transmit a weaker radio signal than the Wind /Temperature sensor with its four batteries. Base Station - This is powered by a mains transformer which plugs in the bottom rear of the unit and also has four AA batteries in the base as a backup supply in case of mains failure. The main control is a large round disc which you can rotate or press at top, bottom, left and right to select functions. The screen is divided in to five sections. At the top is the weather station forecast for forthcoming weather, this is based on atmospheric pressure changes. Below that is the temperature and humidity indication. By pressing the right side of the control you can move a cursor around to the different regions of the screen. With the cursor in the temperature section, rotating the control changes the indication between inside, outside and any additional temperature sensors you have connected. The next section of the screen displays wind speed and direction. Using the control you can display the maximum speed, average speed and gust. The next section displays either atmospheric pressure, rain fall or UV index, from the optional UV sensor. There is a digital display and a trend display of the last 24 hours. At the bottom of the screen is the time displayed and using the control you can display the date. The built in clock get its time from either the MSF Radio Time Signal in Cumbria or the DCF77 Radio Time Signal in Frankfurt, Germany. This is selectable by a switch, the US model WMR100A is different. In the base there are three more buttons, a "Search" button to resynchronise the sensors with the base station or add additional sensors. There is a "Unit" button to change the displayed units of the indicated parameters and a concealed "Reset" button for when things go badly wrong. The USB connection for the computer is strangely on the left side of the unit which spoils the look of it when you have it connected. but within days of going on holiday the weather station software would inexplicably randomly crash every couple of hours but the next day it seemed to sort itself. This was short lived as within 12 hours of leaving to start my holiday it crashed and remained so until I returned. On my return I tried a number of things to improve the reliability including daily re-boots of the computer but it did not stop the intermittent crashes. I searched the internet and found a program called Watchdog - O - Matic from Kwakkelflap. This program monitors running programs looking for problems. I tried the trial version and found it successfully restarted the program after a crash. I purchased the full version and have been very pleased it. I could now run my weather station reliably 24 hours a day. Weather Computer - Initially I used my main computer to run the software but this used too much electric and was too noisy for continuous use. I purchased a second hand Compaq EN866 SFF computer off eBay for about 40. This runs nearly silently, cool and only consumes about 40 watts of electricity. It was purchased with 256MBytes of RAM but I have since doubled this to 512MBytes from Crucial . 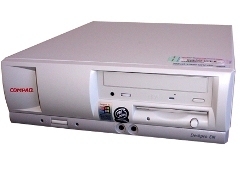 It is fitted with a 20GByte hard disc and a CD drive. The computer, being quite old, only supported USB1.1 so when I added the Weather Cam I fitted a Belkin USB2 card which I got from ebuyer.com. This computer lasted me a year, I have now upgraded it to a HP Compaq D530 2.8GHz, 512Mbyte RAM and 40Gbyte hard disc, this will allow further improvements (see web server below). UPDATE: The Compaq D530 was short lived, the chipset heatsink fell off when one of the anchors came away from the circuit board. After re-soldering the anchor the computer failed to start up and I believe to be due to the chipset ic overheating. After a brief return to the now underpowered Compaq EN866, the web site and weather station is now running on a HP 7700 SFF computer with a E2160 CPU, 1GByte DDR2 RAM and a 80GByte HDD. Like its predecessors the DC7700 runs nearly silently and is economical on electricity. Additional Sensors - Since setting up the WMR100, I have purchased two additional sensors, a THGR810 temperature/humidity sensor and an UVN800 UV Index Sensor. Both sensors are power by two AA batteries and are weather proof. The temperature/humidity sensor, I use to monitor the house temperature and is not displayed on my web pages. The UV sensor has been a bit problematic in positioning. The wireless link is worse than rain gauge and many places it tried site it, proved unreliable communications with the base station. The UV sensor also needs to remain out of the shade, in sunlight for most of the daylight hours. Weather Cam - The camera I am using is a old Logitech Quickcam Zoom which looks out of an upstairs window. I am lucky in that there is a side road opposite so I am not overlooking anyone else's house. The camera is a USB 2.0 devices and is connected to my weather computer. After trying a number of demo software packages I ended up with Image Salsa which I found the best. 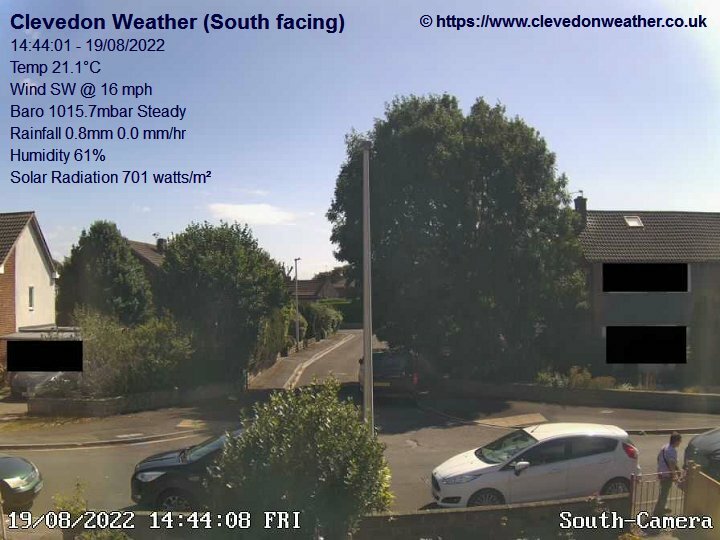 I use Image Salsa to capture an image from now camera every 10 minutes (20 seconds on www.clevedonweather.co.uk site). It then saves a jpeg which VWS uploads on to my web site. Image Salsa also has a ftp program built into it and I use that to upload an image on to wunderground. Wunderground collate all the jpegs into 24 hour video clips which can be recalled from their site. Since using Image Salsa I have had few problems with it. Wunderground provides a good archive from my weathercam but with 10 minute updates it is hard to see cloud movement. I have recently started using MovieSalsa to generate a last eight hours video from 20 second interval photos. This at times show some amazing cloud formations and on clear nights you can see the moon and stars arc across the sky. This video is only available on the www.clevedonweather.co.uk site. Web Server - I monitor the web traffic to me web site and concluded to I was getting 20-40 visitors a day, mainly to my WeatherCam. Uploading web pages to my VirginMedia webspace every 5-10 minutes meant transferring large quantities data for only a few people. I felt it would be better to host my own web server. After some research tried Apache HTTP server for windows. I obtained a new domain name clevedonweather.co.uk from 1&1 internet and I was ready to start. Apache seemed easy to setup for my basic needs. I reconfigured VWS and ImageSalsa to write files directly into the web directory. This means the WeatherCam image is updated over 20 seconds and the weather pages over minute. I am still uploading files to the original VirginMedia site but much less frequently. Another software program I have recently tried and purchased is BMEtreme (Bandwidth Monitor Extreme) home edition from LP23.com. This software costs $24.95 and logs the daily, weekly and monthly internet traffic. ViginMedia like many inter providers only provide dynamic IP addresses and do change from time to time. To deal with this I use Zone Edit free DNS service with zeDyn : ZoneEdit's open source dynamic update client. Search Engines - It is no good producing a web site if nobody knows about it. It is important to make your web friendly to search engines. Google provides a couple of tools to help, Webmaster Tools and Analytics both require you to create a free Google account before use.